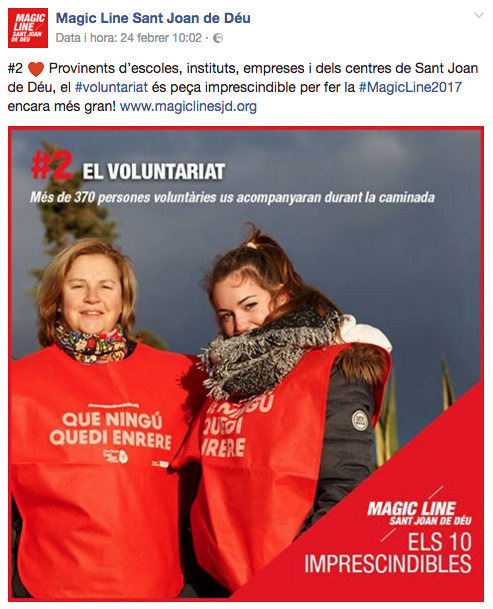 Facebook message of Magic Line to value volunteering / Photo: Magic Line Facebook page. 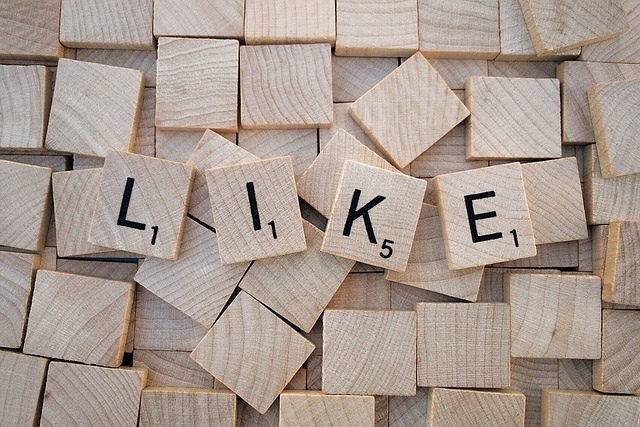 For nonprofit organisations, social media can be a space to catch citizens’ attention, connect with the social bases and build up a community. 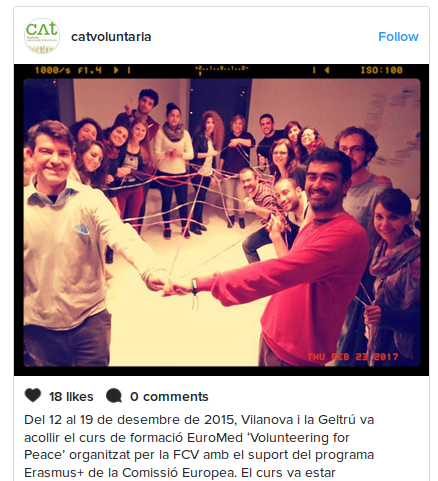 Here we offer you some key elements to secure the commitment from volunteers, using the social media. Facebook, Twitter, Instagram… they should all be much more than spaces for nonprofit organisations to post things. Social media are characterised for being a space to interact, communicate and build up a community. They are ideal spaces for nonprofit organisations. However, creating a critical mass that will follow you on the media and participate in your community is not that easy. But if you are able to do this, it will be very easy to spread your message, your causes, your activities and calls to volunteer, etc. Valuing communication via social media, dedicating the time and effort to do this as best as possible will be useful both to attract new members and volunteers to the organisation and also to achieve other goals of the organisation. It is difficult to distinguish one from the other. That is why we would like to bring you some guidelines on how to set up a communication strategy for the social media and some tricks to canvass, retain and motivate volunteers for your nonprofit organisation. It is never too late to create a communication plan for your organisation. When you do this, make sure to align your contents strategy for the social media with your general communication strategy. Make sure there is coherence between both these elements, and always bear in mind the defining characteristics of social media. Setting goals for what you are aiming to achieve with your communication on social media will help you establish a strategy, follow-up and study the results. Write down your goals and go back to check them once in a while. The most usual goals among NGOs tend to relate to achieving commitment in the community; retaining donors; getting new members or donors; making the brand known. Very often, nonprofit organisations declare that their target audience is “the society at large”, but for sure we could be a little more specific. 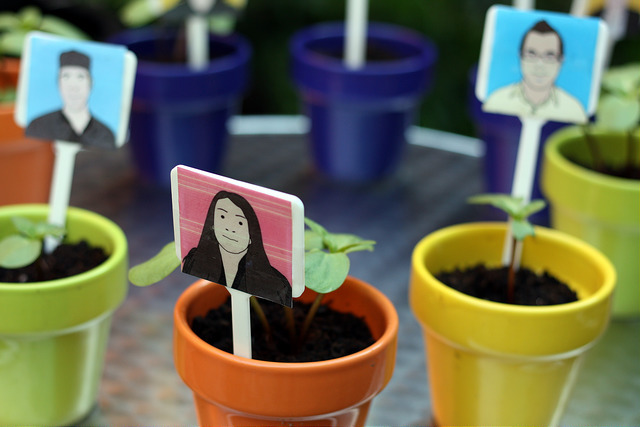 You can define different types of people you are interested in and create different strategies for each profile. If you are able to get a critical mass of followers your messages will have a greater outreach. You don’t need to be on each and every social media. It is quite likely that the time you have to work on communication is limited; therefore, it’s best to focus on those social media where you will find your potential audience and dedicate time and efforts to the spaces you have chosen. Filling out the profile on the social media you choose with useful information about your nonprofit organisation will help people to reach you. At first, when you create an account, you will be followed by people who are close to the organisation. Encourage them to invite their friends to follow you and share your Facebook, Twitter or Instagram profiles on other communication spaces of your entity (web page, mailing list, meetings, other networks…). You can also try approaching influent people within your field to give you a hand with getting the message across, be it your profiles, your calls to volunteer, your campaigns, etc. You can take a look at the contents you’ve shared in the past that have been more successful, as well as asking your followers directly what they would like to hear from you. The same applies to the moment you decide to post something and the quantity of outputs. You must study and establish the best time to post as well as with what frequency. Experts will say you need to diversify the type of message you share. Besides disseminating your calls and actions, it is advisable to share information linked to your causes, other nonprofit organisations, the values you defend, etc. Social media are informal spaces where there is room for humour and touching messages. Visual contents can get you much further than just words. 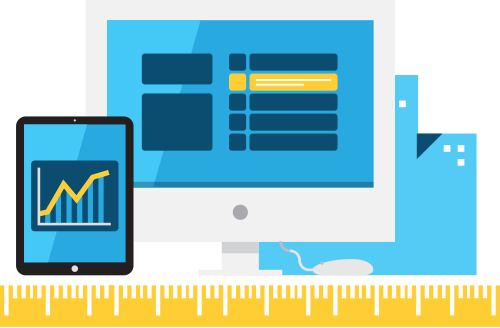 Creating a composition, charts or even infographics is becoming easier by the day and there are many free tools available for this on the Internet. 7. How should you share your calls to volunteering? Once you’ve thought about all this, you can launch the campaign and see if it is effective. You may want to change the type of message and image/video you’re using, or maybe post it on the media depending on the features of each media; tag people and ask them for help in spreading the campaign, etc. You should always add a link with “more info” so that people who are interested can get all the information on volunteering opportunities. Staying informed of the developments in the field in which you are working and sharing the relevant information can be useful to position oneself in the sector as a reference. In the social media, one cannot be egocentric and only speak about oneself. 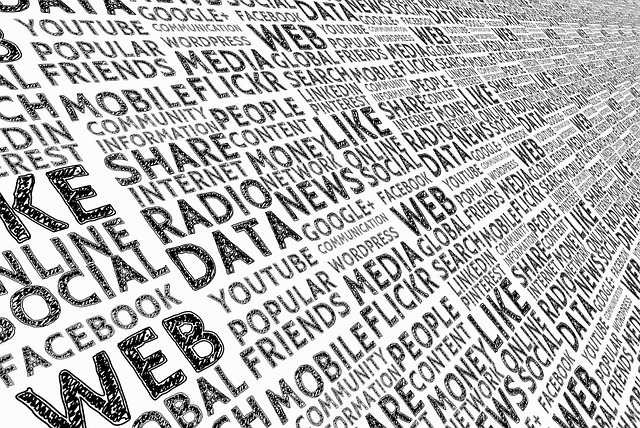 With content curation your organisation can bring variety into its publications and contribute to disseminate valuable contents. The whole team should be involved in this task. You can even contact volunteers that are active in the social media so they can provide you with information they find. The key word when referring to social media is engagement. Ensuring that our social basis is engaged must be a priority. On social media we cannot just limit ourselves to disseminate our actions. We must generate a conversation. Answering questions, comments and messages is key. We must also search for relevant hashtags to find new conversations we can join. Whether it revolves around a hashtag on Twitter or creating a private group on Facebook, bringing members and volunteers together and generating a community will make them feel more involved. Keeping people motivated in our organisation is just as important, if not more, than canvassing new members. And when we love something and feel a part of it we usually talk about it to the people around us, right? Word of mouth can be the best tool to encourage new people! Learning about a good experience is the best way to find motivation and try experiencing the same! So, if you want to get volunteers into your organisation, explain the experiences lived by others, acknowledge and value their work and explain everything that has been made possible thanks to their dedication. That will make the people participating in your cause feel valued and proud and will be a source of inspiration for future volunteers. If you get them to talk about their experience first hand it’ll be even better! You can encourage volunteers that are currently in the organisation to share their experience on the social media, mentioning the organisation. This is also a way of showcasing the kind of tasks that future volunteers can do in your nonprofit organisation. Monitoring and measuring the outcomes of our communication strategy is essential to improve gradually. Tools such as Google Analytics or Hootsuite can help us in this task. 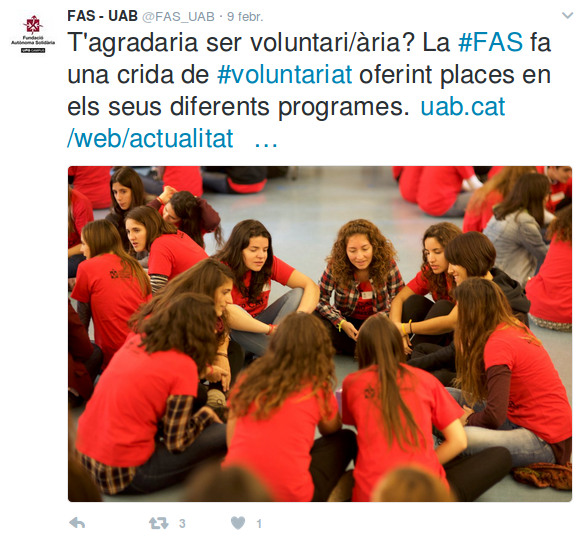 The Fundació Catalunya Voluntària (Catalan Volunteering Foundation) is organizing a non-profit show for Catalan youth to learn about the volunteering projects in Arab countries.